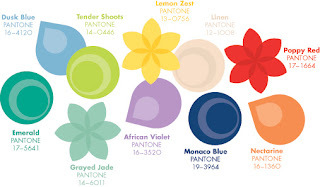 Did you see that Pantone recently released their color report for Spring 2013? I don't follow fashion AT ALL (other than being a huge Project Runway fan), but I do pay attention to Pantone's color reports. These are the colors we'll see in many of the new paper lines that will be at the winter CHA (Craft and Hobby Association) show. Here are the colors for Spring 2013. I really like them! Lemon Zest, Tender Shoots, and Dusk Blue are absolutely gorgeous. I really like the Monaco Blue as well. And African Violet. Poppy Red is great. Nectarine is OK- it's a bit too soft of an orange for me, but I'd definitely use it. Grayed Jade and Emerald are my least favorites in the collection, but I don't dislike them at all. I'm really curious to see which will be crowned the Color of the Year. (I was a big fan of 2012's Tangerine Tango.) They usually announce the Color of the Year in December, so we'll have to wait a bit. I'm hoping it's Tender Shoots. I can only find the Color of the Year going back to 2000 and not a single one of them has been a green. What do you think about the colors for Spring 2013? Hmmmmmmmmmmmmmm... I am torn on these if this is what might be coming to CHA... I am liking the teals though!!! Everything BLUE I love ... which is weird, since I don't decorate with it, or barely wear it either!! LOL!!!!! LOVE GREEN! :) and i'm excited about all of those new paper lines! I hate teal. HATE it. I'm a fan of the monocco blue though and the poppy red.